In the first part of Introduction to Groovy, we saw the first steps to code Groovy scripts, some of Groovy’s advantages like closure support and some syntactic sugar, as well as basic data types. In the second part we will look at other features that make Groovy and exceptional language and a great choice for your toolbox as a Java developer, and perhaps even make it your daily language of choice. It is worth noting that the type is determined in runtime, not at compile time. def text = "Groovy is a dynamic language"
The first example defines a regexp and searches for a match on the string. Because the word ‘language’ has the two vowels u and a together, the search is successful. The second example applies a regexp to the whole contents of text. The result is a Boolean with Boolean.TRUE as its value because the regexp matches as well. The third example compiles a regexp down to a Pattern which will lead to improved performance if you repeat the search with the pattern several times. text = "Programing" - "ing" + "er"
Given this feature and others found in Groovy, it is very simple to write a Domain Specific Language (DSL) which provide other advantages. We may have a look at those in another article. Without a doubt in the last years, we have seen what we commonly call POJOs (Plain Old Java Objects) take center stage in framework development and everyday use. POJOs are actually a subset of the JavaBeans convention. Yup its true, the reason being that among other things a JavaBean must publish events whenever one of its properties changes value. POJOs as they are usually coded do not follow that rule. They are indeed very useful, just take a look at well-known projects like Spring and Hibernate and you’ll immediately grasp the advantages But to be true, its very tiresome to write all the getters/setters by hand. That’s why some IDEs provide a code generation solution for this problem. Groovy goes beyond that and instead, skips completely to the byte code generation step to create getters/setters. All you have to do is follow the convention (now your POJOs are POGOs). To declare a POGO property you’ll have to specify a type and name without access modifier, because if it has one then it will not be treated as a property but as a normal field. Let’s see it in more detail, shall we? Let’s review the example one step at a time. First we define a POGO named Person, which has 2 properties [name,lastname] and one field [id], we know it is so because the formers do not have access modifier and the later does. In the second step, we create an instance of that class. Now notice something curious: we did not define a constructor and still we can use map-like syntax to simulate named parameters on a “default” constructor, Groovy enables it by default on POGOs. On the third step we compare the literal value of the POGO with its expected value and see that it matches the values set on the default constructor, so far so good. We then change the value of ‘lastname’ using dot notation, this might seem like direct field access but in fact it is not. Under the covers Groovy will use its MOP (Meta Object Protocol) to find the most suitable method to call; we might as well have used ‘’ to access the property too. On the other hand if your really want to access a field directly you’ll need to use ‘@.’. Let’s see what happens when synthetic properties are added to our test class. assert person.fullName == "Andres Almiray"
println "ERROR, fullName is not a field of class Person"
// "ERROR, fullName is not a field of class Person"
This last example also shows another feature no other JVM language besides Java possesses: JDK5 annotation support. Java Generics and Enums are also on their way (update: as a matter of fact they are already in the 1.1-beta series. Since 1.1-beta-3, its possible to define Enums in Groovy though). This time we have seen examples of other features of the Groovy language that will make your daily job a lot easier and pleasant. 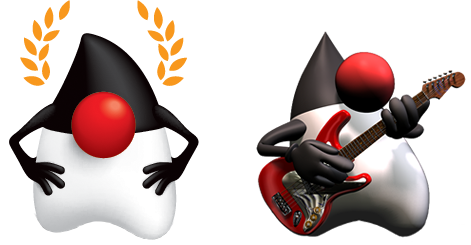 As you may have noticed by now, Groovy provides a tighter integration to the Java platform and language than other JVM languages so far. I hope that this collection of samples have poked your curiosity and incited you to continue learning Groovy.